"She put her hands on the diagram and said, 'Oh! I get it now,' " Joy Orton says. "It was a really powerful moment that the diagram was helpful to her, but only if it's tactile or accessible." But the textbook didn't solve everything. There were still the daily slide presentations. The slides that accompanied biology lectures also included diagrams and illustrations. Theres no textbook for the class, so the presentation was the main source of information. With no alternative text describing the images, their daughter's screen reader couldn't recognize them. The family tried to work with school administrators, but the situation did not improve. So they filed a complaint with the U.S. Department of Education's Office for Civil Rights. The office, OCR for short, is responsible for reviewing cases that allege that students do not have equal access to education. The Ortons' complaint outlined the issues with the slides and emphasized their desire to improve accessibility in their daughter's school district. Two years later, they filed a second, similar complaint to the OCR after their daughter missed a National Honor Society meeting because it was publicized on screens around the school. She wandered the halls looking for the meeting and almost missed an assignment deadline. "I'm not asking for special treatment," her mother says, "I want her to get an appropriate education." In March, the Office for Civil Rights updated the way it processes cases. Now, individuals who file multiple complaints that are similar in nature — as the Ortons did — could see their cases dismissed without being reviewed. The changes at the OCR prompted a lawsuit against the Department of Education. Filed by the National Federation of the Blind, the Council of Parent Attorneys and Advocates and the NAACP, the suit argues that these changes were illegal and contrary to the purpose of the office. The suit takes issue with three changes: First, the office can now dismiss cases it considers as forming a pattern, despite the fact that the revised guidance doesn't define a pattern. Second, the office can dismiss a complaint against more than one group of people — a school and a technology vendor, for example — if the investigation would place what would be considered an "unreasonable burden" on resources. Third, there is now no appeals process. Previously, the OCR gave complainants 60 days to submit a written appeal of a decision. The changes are meant to speed up the process of reviewing cases, according to Liz Hill, a spokeswoman for the Education Department. She says improving OCR's management of its docket, investigations and case resolutions allows the investigators to better accomplish their mission. She said she could not answer any further questions because of "pending litigation," but she stated that the OCR will continue to "accept all complaints including those from third-party advocacy organizations that file discrimination complaints on behalf of students." The Ortons filed their first complaint when their daughter was a freshman in high school. After they submitted it, an investigator told them that the office intended to resolve their case within six months, the standard timeline for any given case. But their complaint was put on hold for several months after their initial investigator left the department. It was finally resolved this May, when their daughter was finishing her junior year. Waiting two years for a resolution, her parents say, was "too long." "Complaints were sort of sitting for a while," says William Zee, a lawyer who represents school districts and universities with a focus on services for students with disabilities. He has been affiliated with OCR cases in the past but is not connected with the lawsuit. In the last few years, Zee says, it became difficult to get responses from OCR and to get schools to make adjustments. However, he says he hopes the changes could speed the process. The limbo is largely a result of the high volume of OCR cases, especially cases of web accessibility, he explains. In 2017, almost 3,700 investigations lasted longer than six months, the office reported. The number of cases assigned to each staff member at any given time more than doubled between 2006 and 2016, from about 15 cases to about 40. The OCR's 2019 budget request projects that staffers will handle 38 or 39 cases each, while the number of submissions continues to rise. The news site Inside Higher Ed, which analyzed Education Department employee data, reported that the OCR has lost nearly 70 staffers since 2017. According to the office's most recent budget documents, the "voluntary separation incentive payments," or buyouts, offered to staff last year were intended to get rid of outdated job descriptions or positions that were no longer needed. During a budget hearing in June, Sen. Patty Murray, D-Wash., questioned why Education Secretary Betsy DeVos did not ask for a larger budget if she felt OCR resources were strained. She also asked DeVos whether the buyouts resulted in fewer staff members to handle the workload. DeVos answered that the OCR has been able to handle its workload with "effectiveness and efficiency." She added that she is proud of what it has been able to accomplish and emphasized that the office will continue to address all complaints appropriately. William Zee, the education lawyer, says he is not surprised the department made changes to address the backlog. He understands the need to deal with complaints quickly and efficiently, but, he adds, it remains to be seen whether removing the right to appeal was an appropriate change. "The lack of the appeals process is the aspect [of the suit] that has the most legs," he says. Eve Hill, the attorney representing the civil rights groups behind the lawsuit, says the changes weren't necessary because the office already weeds out cases that don't meet the standards for an investigation. In fiscal year 2016, the OCR dismissed 58 percent of all submitted complaints because they were considered without merit because of missing pieces. The OCR hasn't released the number of disability-related complaints dismissed after the changes took effect early this year. But an investigation by ProPublica found more than 1,200 dismissals. 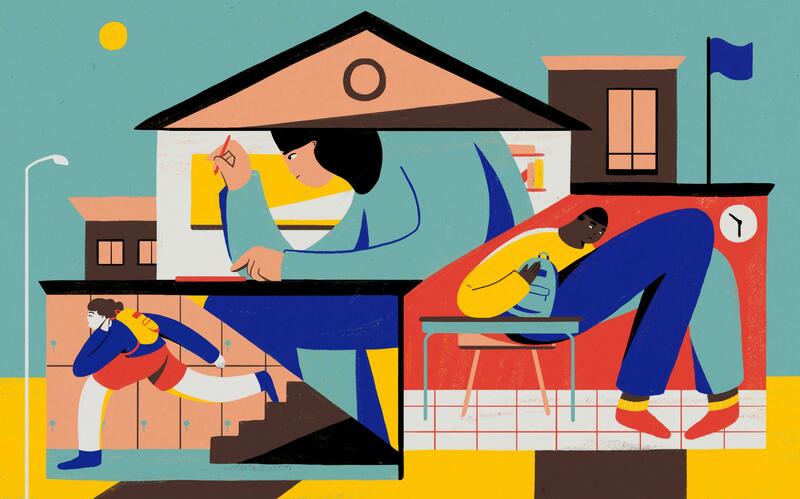 Often schools or districts don't have the technical expertise to make their environments accessible, so parents and disability advocates rely on OCR complaints. As early as 2013, the OCR has offered online webinars and technical assistance presentations to assist schools in making sure that school technology is in compliance with accessibility laws, and to help schools get up to speed with new innovations for students. These initiatives signal the department's focus on efforts to build school expertise, rather than tackling mass investigations of inaccessibility. Paul and Joy Orton say the changes make them hesitant to file additional complaints, even if they encounter more problems with their daughter's school — and they're still waiting to hear whether their pending case has been resolved or dismissed under the new guidance. "Just because I've filed more than one complaint, that doesn't make me a 'frequent flyer,' " Joy Orton says. "It makes me a repeat victim." NPR intern Emily Cardinali contributed reporting for this story.